Nothing beats the ambience of Nammos Restaurant, located at Psarou Bay. Considered one of the top restaurants on the island, opens its doors for the 2017 season, on April 8th. Priding itself on friendly service and an upscale island atmosphere, this place is perfect to start your day lounging under the sun, enjoying the turquoise waters and then continue with high end yet local cuisine while the champagne party will soon turn up the heat. 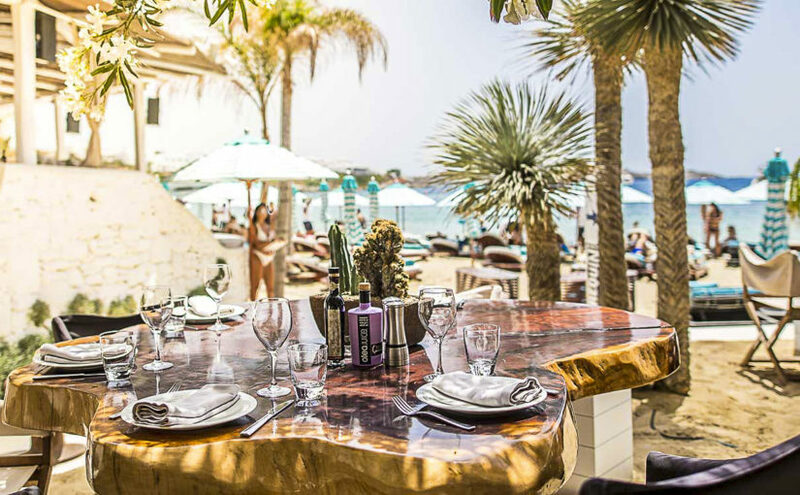 Nammos is a memorable dining and beaching experience worth checking out. The high end boutique is a must-see for all the fashionistas setting foot in Nammos. This small haven of fashion offers some of the finest high-end garments, glamorous beachwear and a top-drawer collection of accessories and beauty products. On April 16th you can enjoy your Easter meals with the holy menus by Nammos. Chill and unwind to taste traditional Greek lamb dishes and meat specials at the glitzy Psarou beach. Book your table and get ready to get spoiled by the most popular delicacies.